Goa is fast becoming a hot destination for foodies. The sunny state has been attracting travelers for a myriad of reasons but when you broadly categorize those reasons it all boils down to fun in the sun and sand. With such a high volume of people visiting for a larger part of the year (November to May) obviously local restaurants needed to step up their game and offer a variety of flavours to satiate even the most discerning guest. To be clear the food was always good – but now you can find just about any cuisine you crave minutes away. Villa Morjim, our luxurious property in Goa is blessed to be located near many good restaurants in the vicinity however if you are willing to travel a little outside your comfort zone beyond Morjim you will not be disappointed. 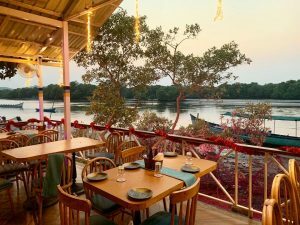 In this article we are going to highlight some of our personal favourite restaurants in North Goa. Gunpowder – This restaurant lives up to its name. Gunpowder is a spicy powder very popular in South India and the food in the restaurant is fiery! A lot of the dishes on the menu are from Kerala and Andhra Pradesh and there are also a few western plates. What keeps us going back is the Kerala Beef Curry and Malabari Parothas. The curry is divine and when you dip the soft flaky Malabari parotha this combination is a match made in heaven. The restaurant is located in Assagao in a traditional Portuguese style villa and other favorites include the pork ribs and beef chilli fry. To be fair anything on the menu will exceed expectations but do not leave without trying one of the hot curries. Drinks are exceptional with our favorite being the Sangria. 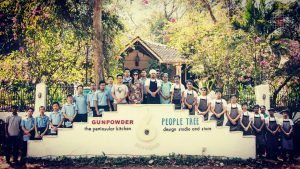 What’s great about Gunpowder is that it is open during the monsoons and slowly more restaurants in Goa are following suit. Black Market – A brand new arrival on the Goa culinary scene is Black Market. The younger sister of old haunt the Black Sheep Bistro is on everyone’s radar and for good reason. While the vibe in both restaurants are different, both have the same belief that all the ingredients used in the food and even in the drinks must be sourced locally giving a boost to sustainable farming. The food is sophisticated often serving up seafood but in innovative pairings with other ingredients. The drinks are original and there’s even a self-serving beer tap near the entrance! 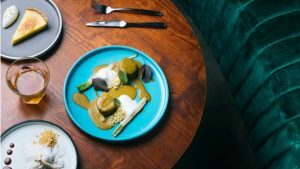 Sublime – Winning the award for the best fusion food from The Times Food Award for a consecutive three years in a row tells you everything you need to know about Sublime. With a casual ambience and lots of emphasis on the quality of food and the presentation you will come away having had an excellent meal. The European menu is the brainchild of Chris Saleem and the flavoring is just sublime. Pick from the selection of wines for the perfect accompaniment to your meal. The restaurant can be found in Assagao. Burger Factory – Sometimes you want to go back to the basics and just gorge on a burger and a beer. 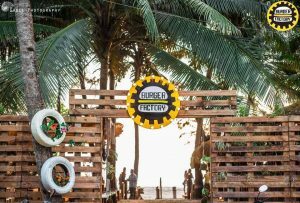 And let’s be real, burgers are the greatest when you want a non-fuss, no frills kind of meal so, if it is burgers you crave then head on to The Burger Factory in Morjim. Freshly made gourmet burgers and such a good variety that you will be spoiled for choice! On the beach with incredible views and a menu of cocktails to complement your preferred meat, no visit to Goa can be complete without a visit to this restaurant. The Lazy Gooze – The Lazy Goose is fantastic. Located in Nerul and overlooking a river, this is an ideal place for a sundowner drink. Being an open-aired restaurant, the vibe is casual and relaxed. Personal favorites from the menu are the stuffed baby crabs and the prawns doused in butter garlic sauce. A chilled beer with these two delectable dishes goes down like a dream. 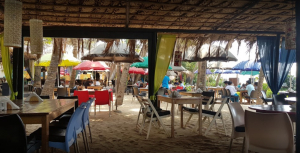 La Plage – Minutes away from Villa Morjim, a classy restaurant on Ashwem beach has been the talk of the town for the last few years. A beach shack that is a bit more up market then the traditional goan beach shacks, La Plage is all about ambience. So if that is a criteria on your list of restaurants to visit then be sure to check this place out first. What is seemingly popular are the burgers and seafood and there are a few starters that stand out like the carpaccio. No good meal is complete without a good cocktail and La Plage has plenty to choose from. At this point if your mouth is watering just reading these descriptions, do yourself a solid and consider a stay at Villa Morjim. There are many more restaurant recommendations we are happy to throw your way in order to make every aspect of a trip a brilliant one. You can also visit www.the-orchard.in to know more about our property in Uttarakhand.  The Orchard: A Perfect Valentine’s Day Escape!